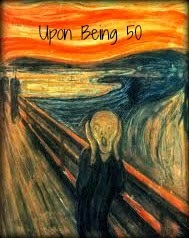 In less than a week's time I will be 50 years old..... 50 ..... years..... old! That's a total of 18, 262 days or 438,291 hours or 26,298,000 minutes that I've spent on the planet..... only a third of which made some kind of sense at the time. I am not, to be perfectly frank, entirely prepared to be an actual, whole, 50 years old. Even though I've known it's been coming since ... well... since I was 49. I did write, in a futile attempt at some level of acceptance, a bucket list of things to do before the big day as well as a list of things not to do. And I absolutely achieved everything I set out to do on one of those lists.....though I did have to reinstall iTunes. Obvs. But otherwise, I'm in denial: the mulishly stubborn, kicking and screaming and quite a lot of sulking kind of denial that involves regularly drowning myself in a vat of gin and sticking one's fingers in one's ears and going LA LA LA when anyone says the F word. Any F word at all, just to be on the safe side. Still, unless I discover the secret of eternal youth or a time machine within the next few days, which is unlikely admittedly, I will be f..f...f..ing fifty years old, like it or not. I have a huge amount of experience of this tragedy. PS - Do you need the complete series 4 of Baywatch in German?